Home / Creativity / Breaking through the sidewalk…. 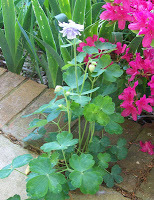 I have been watching this Columbine grow in the bit of soil between the bricks and concrete on my front walkway. I could not believe it when the plant grew flowers in this impossible space. It just shows one what can happen in the face of barriers being thrown in your way and what sheer determination can do to overcome obstacles! What a beautiful lesson to be learned and applied to our daily lives when things get us down! May your obstacles never slow you down!